Standards (BBS) informed that effective Friday, November 23rd, regular gasoline went down from $10.63 to $9.95. While this price will be reflected only on mainland pumps, the price for fuel here in San Pedro will see a slight reduction as well. While the price for regular gasoline went down, other fuels saw an increase. 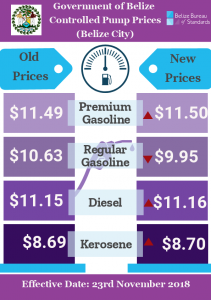 Premium gasoline went up from $11.49 to $11.50, Diesel went up from $11.15 $11.16, and Kerosene went up from $8.69 to $8.70. The one-cent increase in these prices are the smallest increases recorded in the entire year. This last price change is fuel in the 25th adjustment observed for 2018. According to the Statistical Institute of Belize (SIB), as of September 2018, transport carries an average inflation rate of 1.7% due to fuel prices. “With an increase of 1.7 percent for the month, the 'Transport' category was the main contributor to the overall increase in consumer prices compared to September 2017. This was mainly attributed to a 6.2 percent increase among prices in the 'Fuel and Lubricants' subcategory,” says SIB. The Government of Belize (GOB) maintains that the price fluctuation for fuel is beyond their control as international market costs regulate it.